Thinking Out Loud In Sturbridge: Let The Heating Games Begin! Wally, I have two Nests. I love them. HOWEVER!!... A compatible WiFi router is absolutely essential for it to work correctly. Why the router?.... Nest pings the router periodically basically saying, "here I am...here I am....here I am...." An incompatible router will cause the Nest to over-ping the router at a rate much faster than its normal interval which results in draining the battery. Both of mine went dead in a couple of weeks with my two wire heating system. 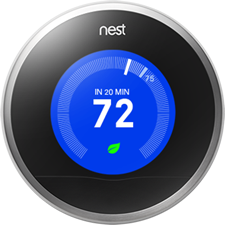 When I added a third wire to the system, essentially giving the Nest lots of power, both thermostats actually got warm to the touch due to the over-pinging and the heating of the WiFi chip inside the Nest. Once my problem was traced to the incompatible router, I replaced it with a Netgear WNDR4500, my problem was solved. The Nests cooled down and I had a properly functioning system. But by then it was May, and I no longer needed them! So I'm entering my first season with both of them up and running as they should. The ability to actually see the current temperature of the house from anywhere in the world is something. Also, if you're out, you can raise the heat so you can arrive back to a warm home. They're a wonderful device, but take a little patience to work out possible wrinkles if you're installing them yourself.